Play is a basic element of human life and the playing of games is found virtually every society in the world. A traditional game can be itself a rich and authentic expression of a culture, while also giving rise to artefacts of great diversity and beauty. 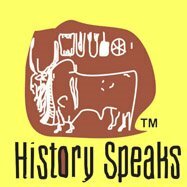 In the last five thousand years, Indian Subcontinent has shown greater creativity than probably any other part of the world in the range and quality of its games, whether of chance or skill, and of its game-related artefacts. A natural flair for gaming, allied to brilliant aptitudes for artistic design, mathematics, numerology, and intellectual or metaphysical inquiry, have all played their part in this. 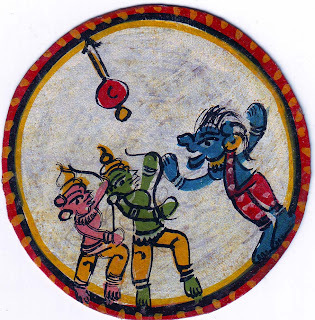 In daily life, at all levels of society from village to court, the playing of traditional games and contests constituted for both sexes a continuous experiential link between childhood and adulthood. Playing games of increasing complexity from youth into maturity served not only as a diversion of pastime but as, in some cases, a mode of learning. 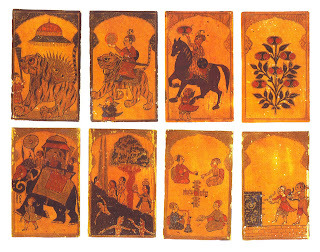 One of India's numerous traditional games is Ganjifa Playing Cards. There are different interpretations of its origin. The Colliers Encyclopaedia on Books says: From its introduction by the Moors, who had forcibly wrested the secret from the Chinese, papermaking moved to Italy, to cater to a rage for card playing among other things. A public eager of 'images' souvenirs of events and shrines…was rising on every side. The earliest mention of Ganjifa is from Yusuf Ibn Tagri Birdi's "Annals of Egypt and Syria" dealing with events of the year 1417-1418 AD where "Kanjifah" was 'played with high stakes by respectable and rich people', and subsequently, a century later, we hear of ganjifa being patronised by Shah Ismail, the first ruler of Safavi dynasty in Persia – an eight suited game with twelve cards in each suit. Siddharth Y Wakanakar claims that'ganj' could well be Sanskrit, since 'ganj' means to make noise and the winner always shouts due to his elation at his victory over other players. Another group of scholars argue for China. AD 969 is the earliest date for Chinese playing cards, the earliest record playing cards of the world. Could ganjifa have originated from China? Could China – the land in which paper was invented – be the source for playing card games in the world? Most writers follow Rudolf von Leyden's conclusion that ganjifa travelled from Persia to India, based on the etymology of 'ganj' being a Persian word, meaning treasure, treasury or minted money. There is always one money suit named after a coin of local currency. The word ganjifa makes its first appearance in India in 1527 in the dairy of Emperor Babur, but no further description is given, except that he sent Ganjifa to his friend in Sindh. This was probably the eight suited packs of 96 cards. However, in the Ain-I Akbari by Abu'l Fazl (c. 1565) there is a detailed account of not only an eight-suited pack but an "ancient" twelve-suited pack. It is often said that Ganjifa was introduced to India by the Mughals in the 16th century, but it is equally possible that it arrived earlier, when Turkman princes emigrated to the Deccan in the late 15th century. Certainly the earliest known design for a ganjifa card is attributed to Ahmedanagar (Maharashtra) and dated around 1580. Ganjifa practically died out in its homeland when the orthodox Shah Abbas II of Persia (162-67) banned the game. In India, however, the game and its cards spread over most of the country. 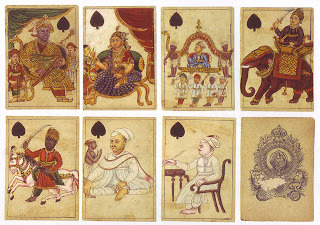 Although initially played by Muslims, it was taken up enthusiastically by the Hindu population and the cards were adapted to suit their taste. Even today, in Orissa, cards are still being played, but elsewhere it has been entirely superseded by games with the standard British pack. According to the account provided by Ahil Shirazi, the eight-suited Mughal ganjifa cards are ghulam (servant), taj (crown), shamsher (sword), ashrafi (gold coin), chang (harp), barat (document), tanka (silver coin), and qimash (merchandise). These represent the household of court, treasury, armoury, gold mint, women's quarters (zenana), administration, silver mint, and stores, respectively. During the time of Akbar there was a minor change in ganjifa suit – the gold coin was designated surkh (gold) and the silver coin, safed (silver). They are often identified with the sun and moon respectively, and faces may be depicted on the gold or silver discs. The pack consists of 96 cards (eight suits of twelve cards each); ten of each suit are number cards and two are court cards: the mir (king) and wazir (minister). The mir is generally seated on a throne, though the mir of ghulam usually rides an elephant and the mir of surkh may be represented by the sun shining from behind one more tigers. Mughal ganjifa suits have different coloured backgrounds to aid recognition. The form of the suit signs, the background colours, and the iconography vary from region to region. The numeral cards of the ghulam suit usually show little men sitting in rows or in an architectural structure, but in better-quality ' packs they may show the correct number of people engaged in scenes of everyday life. These can be the most interesting cards in the pack, though from the point of view of actually playing ganjifa, it is more difficult to count up the number of people to give the value of the card. Some scenes are quite unique in Mughal ganjifa cards – acrobats, wrestlers, swordsmen, musicians and dancers, performing animals, fights between elephants, and also birds which seem to be bulbuls, there are drinking parties, sometimes taking place under the palm-trees where toddy-tappers are at work, and people taking bhang, huntsmen armed with a gun or bow and arrow stalking blackbuck or tigers or engaged in archery practice, soldiers marching or are ferrying in a boat (sometimes they are in action besieging a city), ascetics meditating alone or receiving visits from nobility; Islamic scholars studying in a madrasa, noblemen holding court or are being carried in a palanquin and ladies bathing. 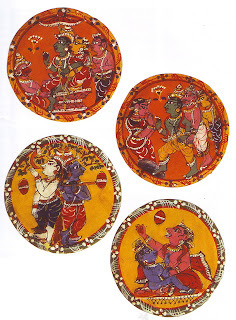 Many of these subjects are in the common repertoire of the painters of Indian miniature art. 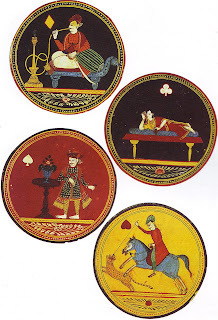 The variation Mughal ganjifa 8 suit cards are also practised in Sawantwadi of Maharashtra, where it is called 'Changa Kanchan'. It is called Changa Rani in Nirmal in Andhra Pradesh. Orissa has its own versions of the eight-suited ganjapa (the Oriya word for ganjifa), and the suit signs have become almost unrecognisable. In particular the ghulam suit has become gulab (a rose) and this is what the suit sign represents. The most common pack has on the wazir, the hero Arjuna in an attitude of worship and on the mir, the object of his devotion, Vishnu as Navagunjara: in this form, the body of Vishnu is made up of elements of nine different creatures. 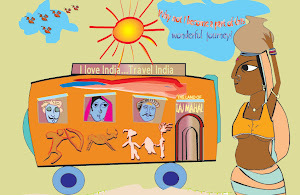 Other packs show Krishna on the mir and Balarama or Radha on the wazir, or the mir may be in a temple chariot and the wazir on an elephant or a horse. The court cards for these packs will be the same in each suit, but other packs have eight different scenes on the wazir cards. One of these is known as ashtamala, the eight deeds of the young Krishna in which he conquers various demons. 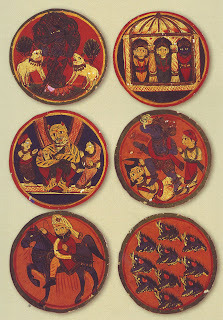 Another shows eight scenes from the Ramayana. This epic seems to be particularly popular amongst the card-players of Orissa, and one pack has a scene from the story depicted on each of the 80 numeral cards. Cards based on the Dashavatara (the ten incarnation of Vishnu) probably came into being in the 17th century, possibly in Deccan. This was an adaptation of the eight-suited Mughal ganjifa, and many cards from the Deccan show a similar iconography, with the avatar enthroned on the raja (king) and on horseback on the pradhan or mantri (minister). Matsya (half human half fish) and Kuruma (half human half turtle) are to be found in every Dashavatara pack, as are the next five: Varaha (the boar), Narasimha (man-lion), Vamana (Brahmin dwarf), Parashurama (Rama with the axe), and Rama (hero of the Ramayan). Krishna and Buddha are generally accepted as the eighth and ninth incarnations and they appear from ganjifa from Sawantwadi in Maharashtra and parts of Rajasthan. In other parts of India Balaram is depicted as the eighth incarnation. In Orissa the eighth is however Balabhadra and the ninth is Jagannath. There is no variation in the tenth incarnation, which is always Kalkin, Vishnu's final appearance when he will come on his horse to end the evil of the present age. The suit sign for each incarnation is an appropriate symbol for the avatar, such as a fish for Matsya, a turtle for Kurma, and an axe for Parashurama. Other suit signs vary, again according to the region. Varaha is usually a boar or a conch shell; Narasimha a lion, lion's claw, or chakra (discus-like weapon); Vamana a water pot or parasol; and Rama, a monkey, bow, arrow, or quiver. Balarama's suit sign is a plough, club, or cow; Krishna, a cow, bust of a crowned figure, blue child, or chakra; Jagannatha, a lotus flower; and Buddha a lotus flower or bust of a crowned figure. A sword, horse, or parasol is the suit sign for Kalkin. 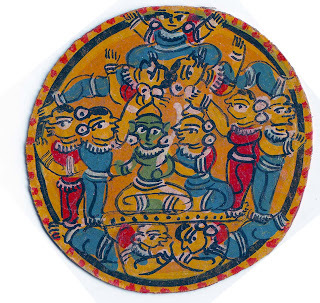 In some regions the raja or pradhan cards show a scene depicting the avatar in action, rather than on a throne or on horseback. These scenes can be particularly lively and entertaining. For example, on the Matsya, Kurma, and Varaha cards, Vishnu is shown fighting the demons Hayagriva, Panchajana, and Hiranyaksha respectively. Although the ten-suited Dashavatara pack is used in Orissa, it is more common in the Puri district to find packs of 12 and 16, sometimes even 20 or 24, suits. These packs retain the basic ten incarnations but they are supplemented by additional deities, such as, Ganesha and Karttikeya, appear in the twelve-suited pack and Shiva, Brahma, Yama, and Indra are added to make sixteen suits. Most card games seem to develop over a period of time and, generally speaking, it is only in recent years that the names of their inventors have been recorded. An example is Maharaja Krishnaraja Wodeyar III (1794-1868), who devised many different board and card games, requiring anything from 36 to 360 cards. The packs had up to 18 suits, each presided over by a particular god or goddess, and up to 18 cards in each suit, together with a number of additional cards, with a different role in the game, that did not belong to any particular suit. A representative example of these packs is the Chamundeshvari Chad, with 16 suits, of which one is headed by Chamunda, the patron goddess of Mysore. These cards and the games played with them did not gain much popularity outside the walls of the palace. The Portuguese settled in India early in the 16th century and undoubtedly brought their cards with them. Men in Portuguese dress even appear on ganjifa sets. Later the British and French also settled in India, bringing their own cards, with what are to us the familiar suit signs. The workshops of Sawantwadi were major producers of playing cards, including Western-style 52-card packs. The jack on horseback is a straight adaptation from the wazirs and pradhans of the Mughal and Dashavatara ganjifa. The cards are hand-painted on a variety of materials, ranging from ivory,mother-of-pearl and tortoiseshell to papier-mache, paper, and stiffened cloth. They are usually round, and anything from 2 to 12 cm in diameter. An upright rectangular format was also used, generally for higher quality packs. Paints were traditionally made, often by the artists and their families, from natural materials, but now commercially produced paints are mainly used. Some cards are beautifully designed and executed, others are slapdash and cheaply produced, with newsprint still visible under the design. The backs are usually plain, but a few packs are elaborately decorated on the reverse, though there must be absolute consistency in design, otherwise it might be possible to distinguish the value of the card by any variations. Boxes are often supplied for the cards, usually with similar designs to the cards. Ganjifa were made in many parts of the country, but are now only being painted in Bishnupur, Sawantwadi, Nirmal, and in Parlakhemundi, Raghurajpur, Sonepur and several other Orissan towns and villages. 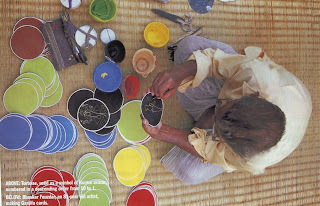 Orissa has long been a major region of card play and production. Ganjifa is a trick-taking game, like whist or bridge, but with strict rules governing what cards may be led. There are no trumps and no obligation to follow suit, if a player cannot win the trick. In half of the suits ten is the highest numeral and one the lowest, and in the other half the ranking is reversed. There are usually three players, four when there are twelve or more suits in the pack, and all the cards are dealt out anti­clockwise. The mir or the raja of an agreed suit is led, and along with this card the player puts a low value card, called the "throne". With these cards he wins the first two tricks. Thereafter there are complex rules about which cards must be led next. If any player has the highest card in a suit he is obliged to play it if that suit is led. If he fails to do so, it loses its value. Players have to remember what cards have been played, and particular skill is needed towards the end of a game to determine which of the middle-ranking cards may yet be used to win a trick when the higher ones have been played, and which can be discarded. The winner is the player who takes the most tricks.